Try Chegg Study at no charge for one week. College students know the value of saving a buck. Well, we’re here to let you in on a cost cutting secret they don’t put in the syllabus. Smart students are saving hundreds of dollars on their textbooks each year by using Chegg.com coupon codes to rent and buy their books off campus. Textbooks can cost upwards of $1,000 a year – making this a lesson in saving you cannot afford to miss. In addition to keeping costs to get the texts you need down, Chegg pays top dollar to students looking to sell previously used books. Imagine all the coffee and late night snacks you can buy to accompany you while reading your books with that extra cash from using a Chegg.com coupon code! Josh Carlson, Mike Seager, and Mark Fiddelke founded the company in 2001 to give students at Iowa State University a chance to connect and exchange textbooks. It was not until 2007, following a change in leadership in 2005, that the company adopted its current model for textbook distribution and began to taste success. Just a few years later, in 2010, the Santa Clara, California based company had rented its two millionth book! Chegg has truly turned the page on textbook distribution. On top their devotion to students, Chegg partners with American Forests’ Global Relief Program to plant a tree for each textbook sold or rented, and offer some texts digitally. 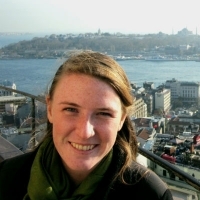 To date, the program has led to over 5 million new trees in the ground while greening up the textbook world. CouponPal wants to help you get the tools to excel in school. That’s why we’ve opened the book on a partnership with Chegg. No matter what you’re studying, this is the place for major savings! We have Chegg coupon codes you can’t find anywhere else. After you sign up for classes this semester, take advantage of our Chegg coupon codes and get your textbooks for a fraction of what you would pay at the student store. With 4.2 million titles to choose from, you’re sure to find what you need! As a college student, you're already broke enough as it is. Don't let paying for textbooks put you in the red! At Chegg.com, you'll find huge discounts on textbooks, rental textbooks, e-textbooks, and more. Follow these instructions to use a Chegg coupon and save even more. You don't have to be a math major to enjoy a good discount! At CouponPal.com, check out the Chegg coupons that are available and find one you like. Click "Get Deal." The page will redirect to Chegg.com. Most Chegg coupons will not require a coupon code – the savings will automatically be applied when you check out, so there's no need to copy any codes. 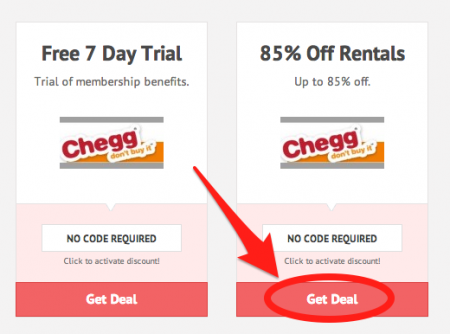 By clicking "Get Deal," you will activate the Chegg coupon. Use the search tool on the Chegg.com homepage to search by title, author, subject, or ISBN for your textbooks. Most textbooks have many different editions, so make sure you find the edition that your professor wants you to have. When you find the right book, decide if you want to buy it, rent it, or download the e-book. Prices will vary depending on the option you choose. Finally, click "Add to Cart." Before you can checkout, you'll have to create a Chegg.com account. 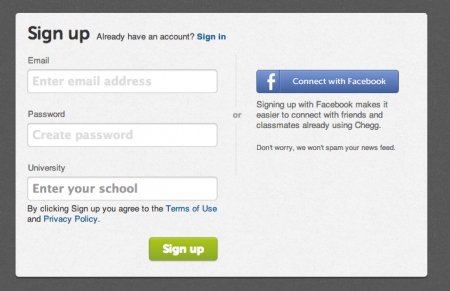 You can choose to sign up with Facebook, or enter your email, a password, and your university or school. Your account is free and besides finding textbooks you can also enter your class schedule, activities, and sell your books. After you've created a Chegg.com account and found all of your textbooks, click on the shopping cart symbol in the upper right hand side of the page. Check your shopping cart to make sure all of your books are right. At this time, you should see the discounts from your Chegg coupon reflected in your shopping cart total. Then click "Checkout" and enter your payment and shipping information. Click "Continue" to finish up your order. Now your textbooks are on their way! Chegg makes renting textbooks for the semester easy and affordable. Save more money for your education by renting instead of buying and selling. Now with popular texts from major publishers like McGraw-Hill, Cengage, Pearson, and Wiley. You can return your rental online by accessing your account at Chegg.com. Usually it is a matter of returning the book in the mail within a predetermined length of time. Why can’t I find the book I’m returning? If you think you owe Chegg a book, but you do not see it, it may be one of several things. It could be that you actually purchased the book rather than renting it. It possible that you have created multiple accounts with Chegg. For more help contact the customer service center by telephone or online at Chegg.com. Can I sell the books I bought? Actually you can sell books and return rentals with one easy form by logging into your account at Chegg.com. When do I return my book? You have until the due date printed on your confirmation email, receipt, and the sticker on your textbook to send the parcel via UPS. If you need to extend the amount of time you keep the book, you can do so by accessing your account at Chegg.com. Can I buy my textbook? If you have lost your textbook, or if you really enjoy it, you can buy it from Chegg at an additional cost. Access your account at Chegg.com. 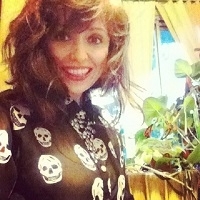 What if my book is lost or stolen? If your textbook was lost or stolen you can replace it with a similar version. You will either send in another book that has the same ISBN number, or pay the remaining balance left on the book. Are there fees for late book returns? Are there additional homework resources at Chegg? As a matter of fact, there are a wide range of features at Chegg.com. These include Solutions Manuals, Scholarships, Chegg Coupons, Homework Help, as well as ways to buy, sell, and rent textbooks. If there is something wrong with the textbook then return it within 21 days. Digital books should be returned within 14 days. Use the enclosed Chegg box with the prepaid return shipping label. Note that the shipping cost will be deducted from your refund. The book must be returned in the same condition it was delivered in to qualify for a refund. Unacceptable forms of damage include stained, torn pages, loose binding, etc. Can I take notes in my rental? You are permitted a reasonable amount of highlighting but please do not write or draw in rented textbooks from Chegg.